This finding indicates that during practice of the Transcendental Meditation technique “there is an increase in the area of the cortex taking part in the perception of specific information and an increase in the functional relationship between the two hemispheres” (1). Synchrony of electroencephalographic (EEG) activity reflects integrated functioning of large groups of neurons. EEG studies have found that during the practice of the Transcendental Meditation® technique, EEG activity is highly synchronized over almost all cortical areas; this synchrony was measured at all the categories of EEG frequencies associated with wakeful awareness (theta, alpha, and beta). At alpha frequencies (8–14 cycles per second) a stable alpha rhythm often spreads to the whole cortical surface; at theta frequencies (4–7 cps) occasional hypersynchronous theta bursts are found over all cortical areas, as well as rhythmic theta trains; and at beta frequencies (15–50 cps) generalized fast frequencies occur with a dominant beta rhythm of about 20 cps, as well as smaller amplitude at 40 cps (3, 4). Synchronous EEG activity at all these frequencies and cortical areas reflects a global integration of brain functioning. (3) Electroencephalography and Clinical Neurophysiology 35: 143–151, 1973. (4) Revue d’Electroencephalographie et de Neurophysiologie Clinique 4: 445–453, 1974. EEG coherence measures the relationship between the EEG activity at two different locations on the scalp; it quantifies the consistency of phase relationship of the two EEG signals at a given frequency. Higher EEG coherence thus indicates greater integration of brain functioning in the measured areas. 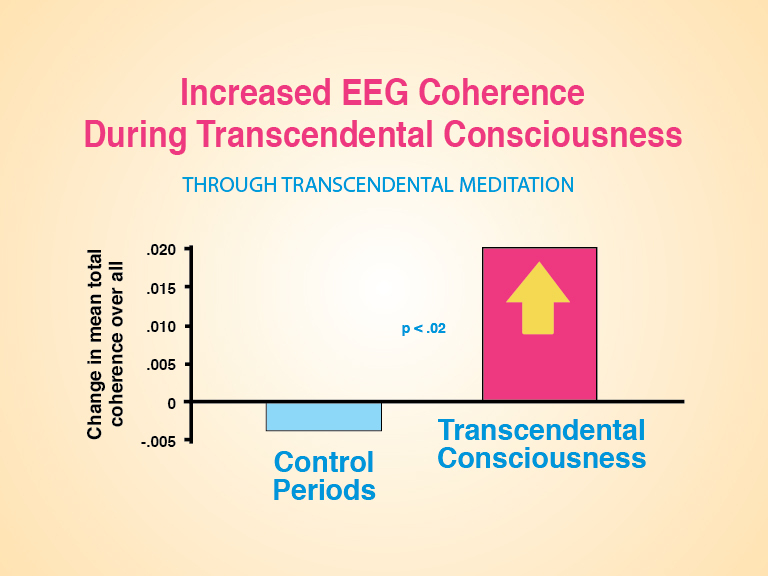 Research has found that during the practice of the Transcendental Meditation®technique, periods of times identified by respiratory changes as periods of Transcendental Consciousness displayed a significant increase in EEG coherence, averaged over all the measured frequencies (1–50 cps) and cortical locations (nine pairs of electrodes) (5). This finding indicates that during Transcendental Consciousness there is increased integration of brain functioning, as reflected in the full range of EEG frequencies and cortical areas measured. During the Transcendental Meditation technique individuals often report the subjective experience of Transcendental Consciousness or Pure Consciousness, the state of least excitation of consciousness. This study found that many experiences of Pure Consciousness were associated with periods of natural respiratory suspension, and that during these respiratory suspension periods individuals displayed higher mean EEG coherence over all frequencies and brain areas, in contrast to control periods where subjects voluntarily held their breath (6). (5) Psychosomatic Medicine 46: 267–276, 1984. (6) PsychosomaticMedicine 46: 267–276, 1984. Subsequent research also found that EEG coherence over all measured scalp areas and over a broad band of frequencies (4.7–17.9 cps) increased significantly immediately before the body lifted off the ground in Yogic Flying (8). (7) Scientific Research on Maharishi’s Transcendental Meditation and TM-Sidhi Programme: Collected Papers, Volume 1: 705–712, 1977. (8) International Journal of Neuroscience 54: 1–12, 1990. (9) Scientific Research on Maharishi’s Transcendental Meditation and TM-Sidhi Programme: Collected Papers, Volume 1: 705–712, 1977. During specific cognitive processes such as reading, speaking, and memory encoding or retrieval, blood flow increases only in very isolated parts of the cortex (10,11). However, research on the Transcendental Meditation®technique has found that during this practice there is increased cerebral blood flow in both frontal and occipital parts of the cortex (12), reflecting an integrated state of cortical activity extending over large areas of the brain. (Please refer to chart.) This finding of increased cerebral blood flow also indicates a state of inner alertness during practice of the Transcendental Meditation technique, because in contrast, during light sleep, there is a decrease in relative cerebral blood flow. This finding also contrasts to the long-term effects of the aging process; cerebral blood flow usually decreases with aging (13). 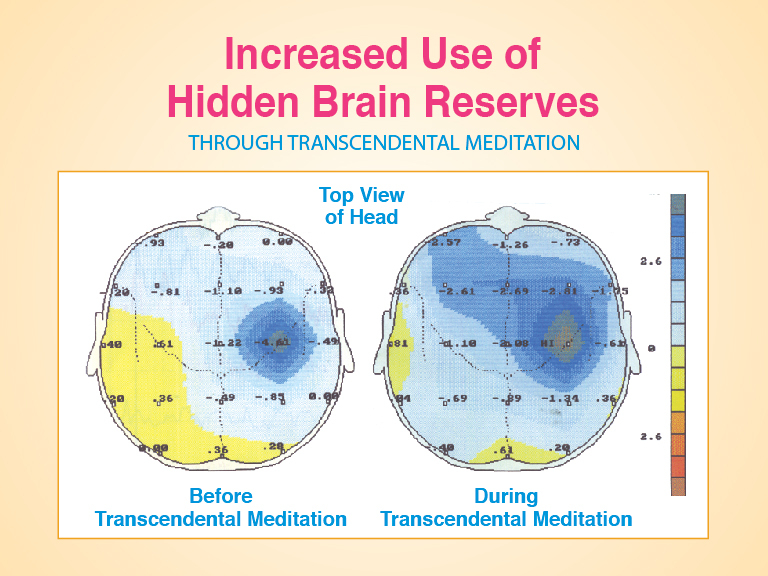 All the findings described above — greater use of the hidden or latent reserves of the brain, increased synchrony and coherence of electroencephalographic activity at diverse frequencies and cortical locations, and increased cerebral blood flow widely throughout the cortex — reflect greater integration of brain functioning during practice of the Transcendental Meditation technique. 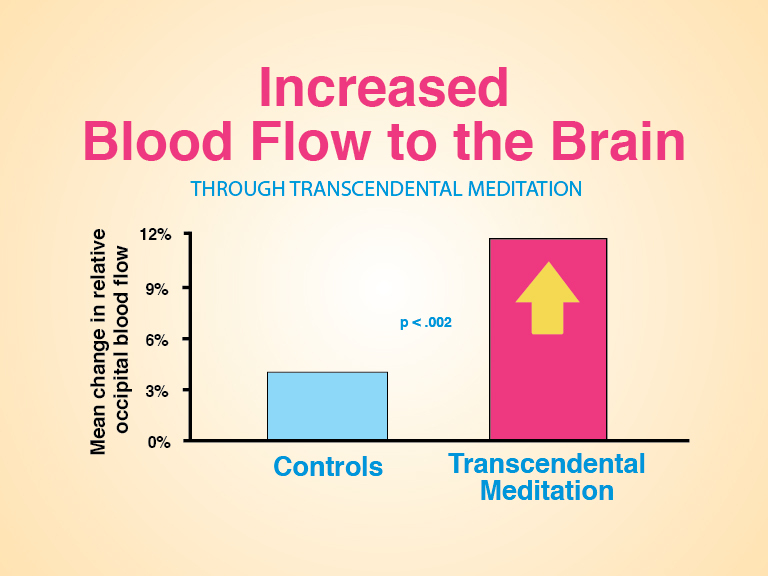 Individuals who practiced the Transcendental Meditation technique displayed significantly increased cerebral blood flow during the practice, in contrast to controls. Increased cerebral blood flow was found during Transcendental Meditation both in the occipital (back) area of the brain, charted above, and also in the frontal area. (10) Science 276: 264–266, 1997. (11) Clinical Neuroscience 4: 78–86, 1997. (12) Physiology & Behavior 59: 399–402, 1996. (13) Kohn, R. R. In Handbook of the Biology of Aging. New York: Van Nostrand Reinhold, 1977. Tasks that require analytic cognitive skills (verbal and mathematical tasks) involve greater activity of the left hemisphere of the brain; tasks that require spatial ability involve greater activity of the right hemisphere of the brain. Electroencephalographic research shows that those who practice the Transcendental Meditation® technique display, outside of the meditation period, greater lateralization (hemisphere-appropriate activation) of brain functioning suitable to the given task. 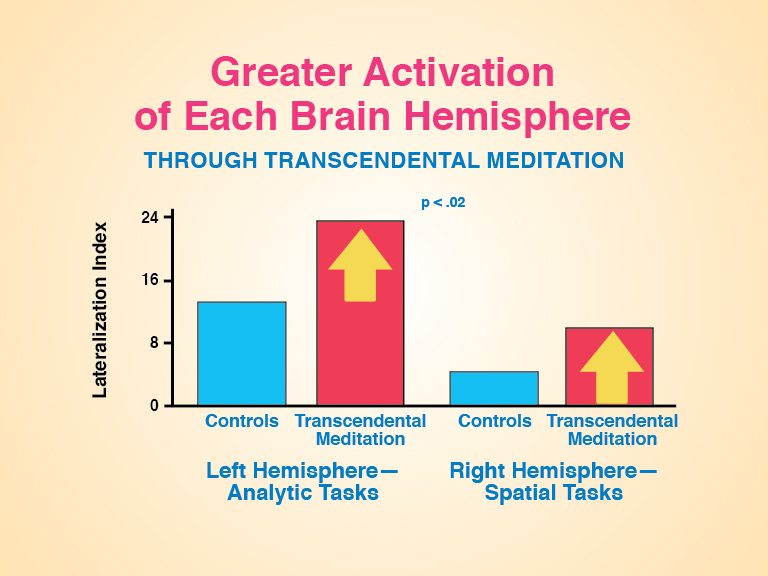 When performing analytic tasks, participants in the Transcendental Meditation program show a greater ratio of activation of the left hemisphere than controls; and for spatial tasks, they show a greater ratio of activation of the right hemisphere (14). These findings indicate more flexible functioning of the whole cortex, in which diverse cortical areas are more capable of active involvement, as required by the task. A characteristic of higher states of consciousness developed thorough the Transcendental Meditation and TM-Sidhi® programs is the experience of Transcendental Consciousness maintained outside of the meditation period, including during deep sleep. Individuals reporting the experience of Transcendental Consciousness during night sleep displayed EEG activity in theta/alpha frequencies, which is associated with restful alertness, together with delta frequency EEG activity, which is characteristic of deep sleep (15). This finding indicates a profound natural integration of diverse styles of brain functioning. (14) Psychophysiology 14: 293–296, 1977. (15) Sleep 20: 102–110, 1997. Cognitive processing involves a sequence of responses in a variety of neural structures; faster processing thus reflects more integrated and efficient brain functioning. Those who practice the Transcendental Meditation® technique show faster response (shorter latency) of brain evoked potentials in the cognitive processing of stimuli (P300 response) (16, 17). (Please refer to chart.) This finding contrasts with what usually occurs due to the aging process: The brain typically responds more slowly in processing stimuli, as measured by longer latency of brain evoked potentials (18). Individuals who practice the Transcendental Meditation technique also show faster response of the brain evoked potentials that are associated with sensory perception of stimuli (19). Again, faster processing reflects more integrated brain functioning. Elderly individuals who practice the Transcendental Meditation program, in comparison to controls of the same age, show faster response of the brain to visual stimuli (shorter latency of P300 response). This type of response of the brain usually becomes slower with age, and this finding thus indicates one aspect of the reversal of the aging process which takes place through regular practice of the Transcendental Meditation program (16). 16) Psychophysiology 26: S29 (Abstract), 1989. (17) Psychophysiology 31: S98 (Abstract), 1994. (18) Evoked Potential in Clinical Neurology (2nd Edition). New York: Raven Press, 1989. (19) Zeitschrift fÙr Elektroencephalographie und Elektromyographie EEG-EMG7: 99–103, 1976. 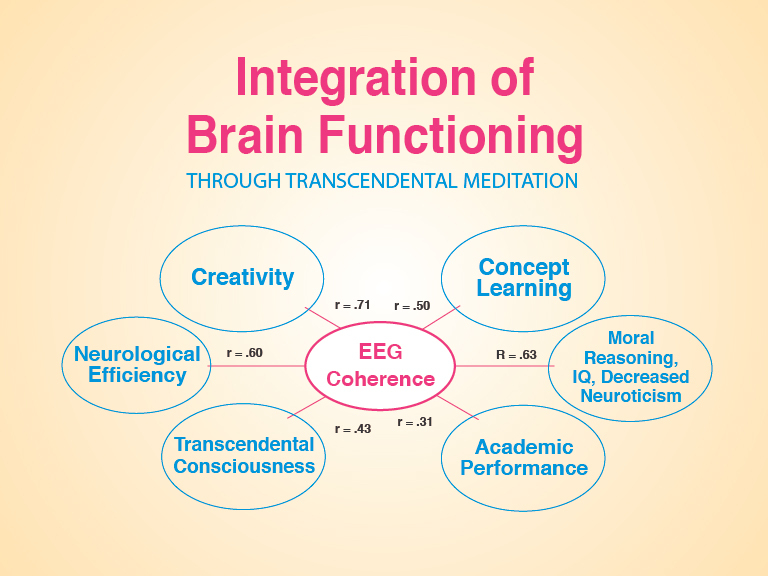 Many cognitive abilities that improve with regular practice of the Transcendental Meditation® program — creativity, concept learning ability, intelligence, moral reasoning — are positively correlated with higher levels of EEG coherence, particularly in frontal cortical areas (20-22). (Please refer to chart.) As noted previously, increased EEG coherence, including coherence in frontal areas, is found during practice of the Transcendental Meditation and TM-Sidhi® programs. High levels of EEG coherence measured during Transcendental Meditation are significantly correlated with higher creativity, greater efficiency in learning new concepts, more principled moral reasoning, higher verbal intelligence (IQ), less neuroticism, higher academic achievement, clearer experiences of Transcendental Consciousness, and greater neurological efficiency (faster spinal reflex recovery) (22). (20) International Journal of Neuroscience 13: 211–217, 1981. (21) International Journal of Neuroscience 15: 151–157, 1981. (22) Scientific Research on Maharishi’s Transcendental Meditation and TM-Sidhi Programme: Collected Papers, Volume 4: 2245–2266, 1989. Individuals who learn the Transcendental Meditation® and TM-Sidhi®programs, in contrast to controls, show continuing development of cognitive abilities that usually stop developing in late childhood, including fluid intelligence (23–24), ego development (25), and field independence (26). (Please refer to the charts.) These measures are related to one another; one of them, fluid intelligence, has been found to be associated with the higher control functions of the frontal lobes (please refer to Development of Cognitive Abilities — Selected Research Findings). It is likely that this unprecedented development of global cognitive abilities after childhood, which is promoted by the practice of the Transcendental Meditation technique, is the expression of greater integration and effectiveness of brain functioning. The findings in this section thus indicate greater integration and effectiveness of the brain processes that underlie cognitive functions; and correspondingly, a unique improvement in cognitive abilities. 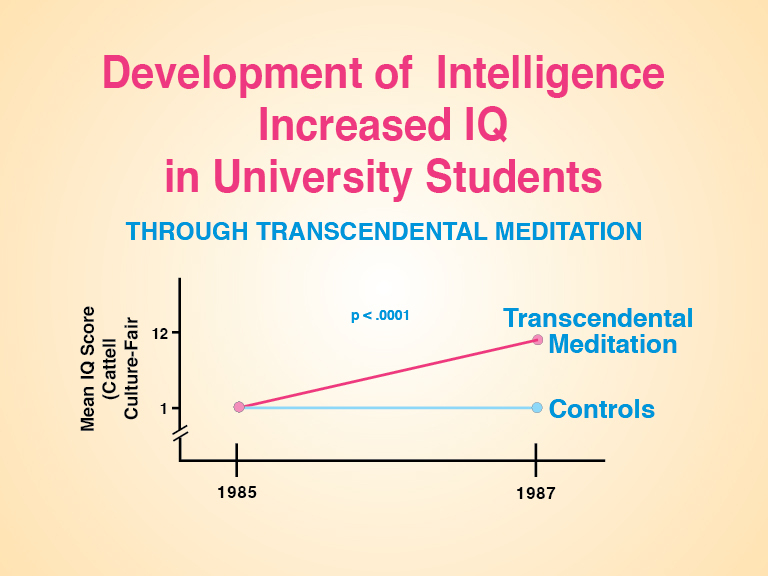 University students who were practising Maharishi’s Transcendental Meditation and TM-Sidhi Programme increased significantly on intelligence in contrast to control students (23). 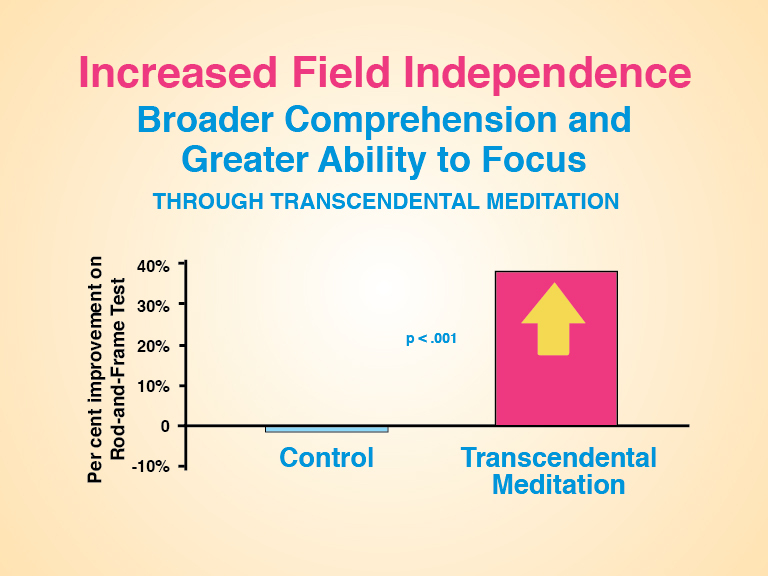 Individuals randomly assigned to learn the Transcendental Meditation program displayed a significant increase after three months, in comparison to controls, on measures of field independence, indicating broader comprehension with increasing ability to focus (26). 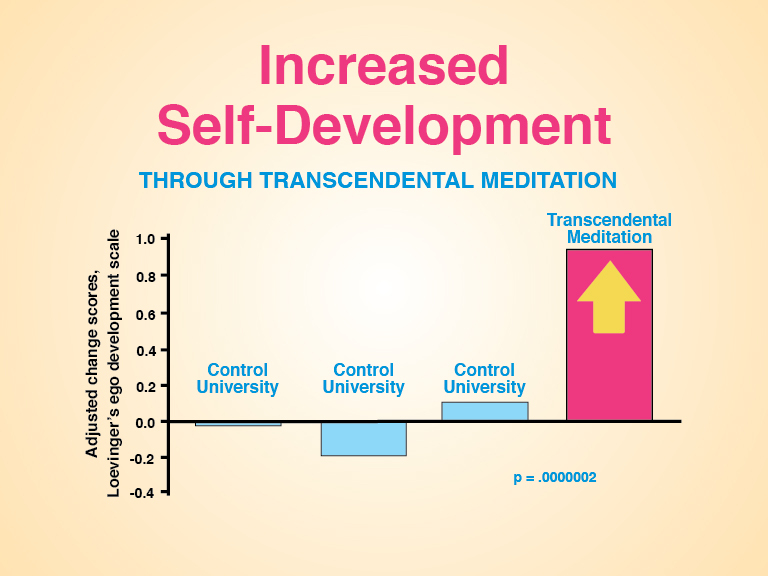 University students who were practicing the Transcendental Meditation and TM-Sidhi programs increased significantly on self-development (ego-development) when measured after graduation, in contrast to control students at three other universities who were not participating in these programs (25). (23) Personality and Individual Differences 12: 1105–1116, 1991. (24) Higher Education Research and Development 15: 73–82, 1995. (25) Dissertation Abstracts International 51(10): 5048B, 1991. (26) Perceptual and Motor Skills 39: 1031–1034, 1974. Higher integration of brain functioning is naturally associated with more integrated functioning of the physiology as a whole. Among the aspects of the nervous system that are most intimately connected with brain functioning are the peripheral nervous system, including the autonomic nervous system; and endocrine processes, which are under direct influence of the brain through the hypothalamus. Integration in the total functioning of brain, peripheral nervous system, and neuroendocrine processes has been found to develop through the practice of the Transcendental Meditation® program, as indicated by the following sample research findings. Individuals practicing the Transcendental Meditation program, in contrast to controls, show more rapid recovery of the autonomic nervous system from stress, as measured by habituation of skin resistance responses (28). The Transcendental Meditation program participants also showed a more stable physiological response to the stressful stimulus (fewer multiple responses), and had fewer spontaneous skin resistance responses (independent of the stressful stimulus) than control subjects, indicating more stable as well as more flexible functioning of the autonomic nervous system. (28) Psychosomatic Medicine 35: 341–349, 1973. (29) Psychoneuroendocrinology 22: 277–295, 1997. Decline in cognitive functioning with aging is assumed to be associated with neuronal loss (30). 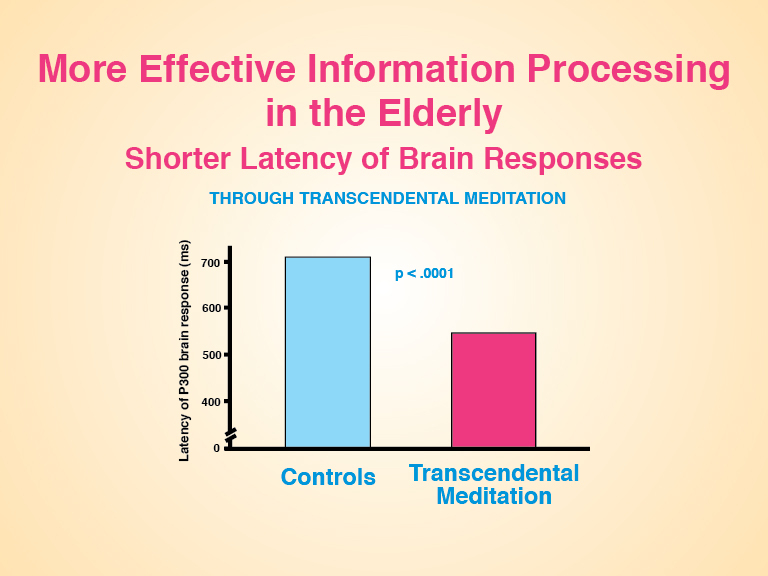 Research has shown, however, that practice of the Transcendental Meditation®technique improves many physiological, cognitive, and behavioral variables that usually decline with aging. These include changes in the following variables most closely related to brain functioning: increased cerebral blood flow (37), increased EEG alpha power (31,32), faster response (shorter latency) of P300 evoked brain potentials (41–44), increased learning ability and improved memory (56), increased creativity (57), increased intelligence(50,51), faster reaction time (50), increased field independence (53), and increased behavioral flexibility (56). These developments, opposite in direction from the aging process, suggest continued brain development and increased integration of cortical functioning in adulthood through the experience of Transcendental Consciousness. In addition, a wide range of other developments opposite in direction to the aging process occur through regular practice of the Transcendental Meditation technique, including decreased susceptibility to stress (54), reduction of high blood pressure (58), reduced cardiovascular disease (59), increased serum DHEA-S (dehydroepiandrosterone sulfate, an adrenal hormone related to good health in the elderly) (60), increased efficiency of endocrine control (55), and reduced depression (61). These results indicate greater integration and effectiveness in the total functioning of the brain and related physiological processes; that is, greater integration and effectiveness in the interrelationship among the cerebral cortex, the subcortical structures of the brain, the autonomic nervous system, and neuroendocrine processes. (30) Annual Reviews of Psychology 49: 72–111, 1998. (31) Electroencephalography and Clinical Neurophysiology 35: 143–151, 1973. (32) Revue d’Electroencephalographie et de Neurophysiologie Clinique 4: 445–453, 1974. (37) Physiology & Behavior 59: 399–402, 1996. (41) Psychophysiology 26: S29 (Abstract), 1989. (42) Psychophysiology 27: S23 (Abstract), 1990. (43) Dissertation Abstracts International 53(6): 3189B, 1992. (44) Psychophysiology 31: S98 (Abstract), 1994. (50) Personality and Individual Differences 12: 1105–1116, 1991. (51) Higher Education Research and Development 15: 73–82, 1995. (53) Perceptual and Motor Skills 39: 1031–1034, 1974. (54) Psychosomatic Medicine 35: 341–349, 1973. (55) Psychoneuroendocrinology 22: 277–295, 1997. (56) Journal of Personality and Social Psychology 57: 950–964, 1989. (57) Journal of Creative Behavior 13: 169–180, 1979. (58) Hypertension 26: 820–827, 1995. (59) Psychosomatic Medicine 49: 493–507, 1987. (60) Journal of Behavioral Medicine 15: 327–9341, 1992. (61) Zeitschrift für Klinische Psychologie 7: 235–255, 1978. The neurological and neurocognitive research reviewed in “Education’s Failure to Promote Use of Full Brain Potential”, indicates that the prevailing systems of education are failing to develop the full brain potential of every student; as a result education everywhere is unable to realize its highest goals. Research shows that experience directly shapes the development and modification of brain functioning. Research also suggests that the type of experience most valuable for brain development after childhood is greater integration of brain functioning, which is not systematically provided by education. Many aspects of cognitive functioning have their basis in the growth of higher, or more integrated, brain functioning. Despite the efforts of educators applying a variety of teaching and curriculum approaches, these cognitive abilities have been found to stop developing after adolescence. This lack of continued growth of cognitive abilities is compelling evidence that education fails to continue unfolding the full brain potential of each student. Research also shows that the brain continues to adapt its functioning to specific channels of learning and behavior. The cognitive activities typically exercised in education (reading, speaking, memorizing and recall), as well as specific categories of knowledge, activate highly specific areas of the brain, rather than promote more holistic or integrated brain functioning. The conclusion from the selected research findings is that the segmented approach to knowledge that characterizes education today restricts the awareness and brain functioning to narrow channels of activity. Restricted awareness leads to problems, mistakes, and the inability to evaluate the environment and act in a way that consistently favors progress and happiness. Scientific research on Consciousness-Based education summarizes findings in neuroscience, physiology, and psychology that verify the development of higher integration of brain functioning, and correspondingly, the progressive unfoldment of mental potential, through the Transcendental Meditation® and TM-Sidhi® programs. Research shows greater integration of all cortical areas during the practice of these technologies of consciousness, as measured by synchrony and coherence of EEG activity at diverse frequencies, by greater use of the latent reserves of the brain, and by increased cerebral blood flow throughout large areas of the cortex. Participants in the Transcendental Meditation and TM-Sidhi programs also show, outside the practice, an integration of different styles of brain functioning, including greater activation of each brain hemisphere; and a unique integration of EEG, associated with the experience of higher states of consciousness. They also display greater efficiency and integration of brain functioning at the basis of cognitive processes, as measured by faster brain processing of cognitive and sensory stimuli; and by development of cognitive abilities that are associated with more integrated brain functioning — abilities previously found to stop developing in adolescence, after the initial maturation of the brain. These findings show that the development of brain potential and of mental potential are simultaneous through the practice of the Transcendental Meditation and TM-Sidhi programs. The research on the Transcendental Meditation and TM-Sidhi programs also indicates greater integration and effectiveness in the total functioning of the brain, the peripheral nervous system, and neuroendocrine processes. This is evident from more adaptive responses to stress by the autonomic nervous system and the endocrine system; as well as by reversal of the detrimental effects of the aging process, as measured in a broad spectrum of physiological, cognitive, and behavioral variables. The conclusion of this research, supported by more than 600 research studies on the Transcendental Meditation and TM-Sidhi programs and 40 years of educational experience, is that it is now possible to develop brain functioning in its totality, for the enrichment of all aspects of life — mental potential, health, behavior, and the society as a whole. Government and civic leaders who are sincere in their desire to do the most for their citizens and nation will avail themselves of this knowledge to eliminate the weaknesses of education by offering Consciousness-Based courses through their existing educational systems. The result will be generations of students who are enlivening their total brain functioning, on the basis of which they will lead increasingly problem-free, productive, and fulfilling lives, directly contributing to progress in every area of national life.